If you’re one of those people who love seafood but have to carry an EpiPen in your purse or pocket, there is a safe, non-shellfish alternative that is delicious and easy to make. Salmon ceviche is a fantastic dish to prepare for your guests and even for children. Salmon is considered to be one of the ideal “brain foods,” due to the omega-3 essential fatty acids that it contains. It is a great source of protein, potassium, selenium and Vitamin B12. It is also considered to be among the fish carrying the least amount of mercury. Soak the salmon cubes in the juice from 5 limes. Cover them in juice and allow to “cook” in the refrigerator for 3-4 hours. 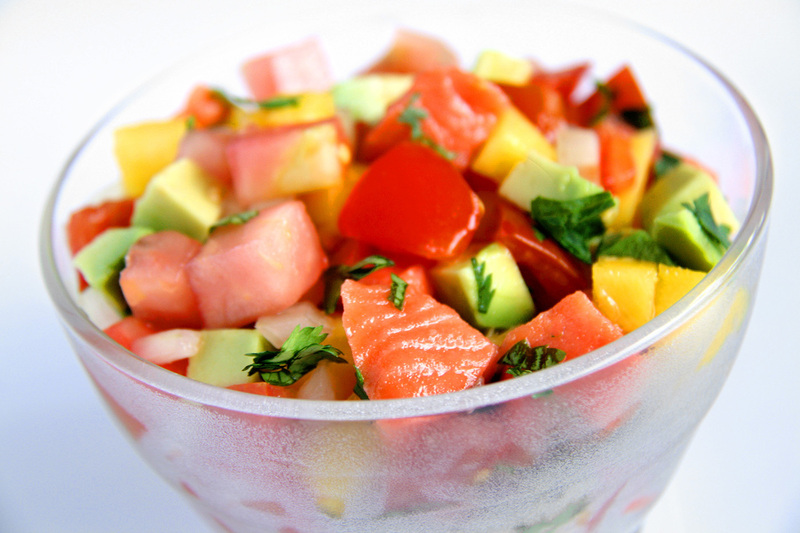 Chop tomatoes, onion, avocado and mango into tiny cubes. Avocado should be last in order to avoid it from turning brown. Drain salmon and add remaining ingredients. Add 1.5 tbsp olive oil, 1 tsp. sesame oil and 1 tbsp. soy sauce. Squeeze the juice from the remaining lime into mixture. Sprinkle cilantro, salt and pepper. Refrigerate for one more hour. Enjoy!